Project management has evolved from few basic principles into a domain of knowledge. Thankfully, many bloggers are helping project managers to stay updated with the latest tools, techniques, methodologies, processes and much more through their blogs. 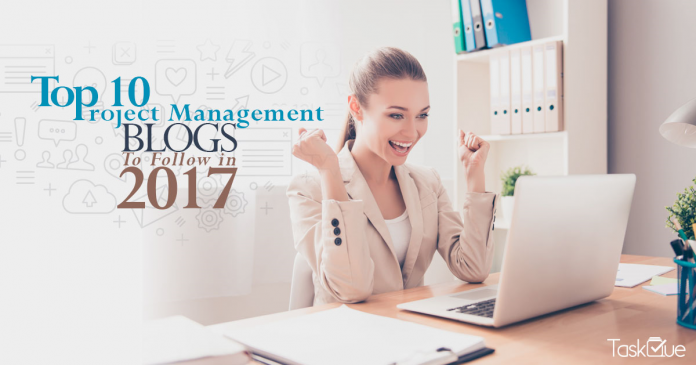 In this article, you will learn about 10 most popular project management blogs that every project manager must read in 2017. If you want something more than a blog, then project management.com blog is for you. 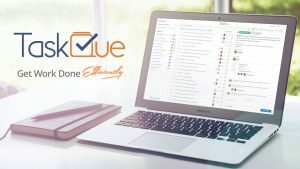 What makes it stand out is that you can start a discussion, connect with other project management experts. Additionally, you can also find useful material to prepare for your certification exams on this blog. Informative and how to articles make it a blog that every project manager should bookmark. It offers everything a project manager needs. With years of project management experience behind his back and more than 4,000 business strategy articles under his belt, you can expect good things from Brad Egeland’s blog. Fortunately, his blog provides just that and reflect his grip over the subject. Named among top 10 project management influencers of 2016, Brad Egeland’s blog provides short video snippets that provide you with project management tips that you will not find anywhere else. The plethora of topics he touches upon makes the blogs an interesting read. It covers everything from project management methodologies to task delegation. 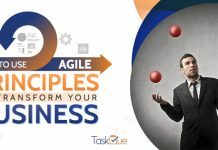 Whether you are a fan of interactive content such as infographics or want to learn the basics of project management through tutorials, guides or tips, and tricks articles or want to read project management professionals interviews, there is something for everyone on TaskQue’s blog. It covers a wide range of topics; from project management to entrepreneurship, startups to organizational cultures and much more. Combine that with an eye-catching design and you get a blog that is worth your time and attention. Apart from being a bestselling author, Peter Taylor is one of the best project management blogger. 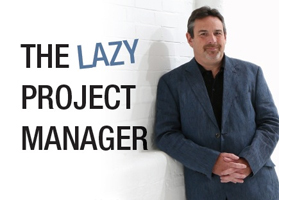 His bestselling books “The lazy project manager” and “The lazy winner” highlighted a new idea called “productive laziness”. 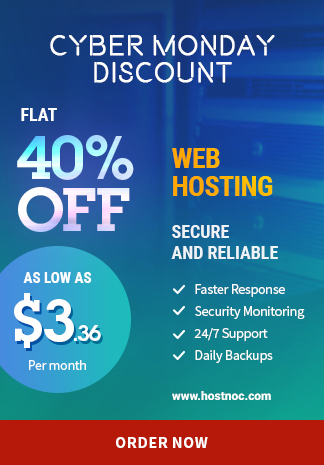 If you want to achieve more with less, then his blog is what you are looking for. Read his blog and you will learn to “Work smarter, not harder” and benefit from it as well. 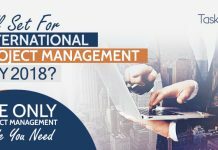 It enables project managers to complete projects inside the budget and before the deadline, thus, resolving one of the biggest problems for project managers. 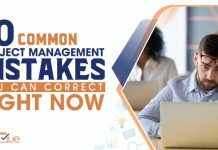 With more than 15 years of experience in risk management and project management training as well as consulting and coaching, Ron Rosenhead’s blog offers a wealth of resources for project managers. 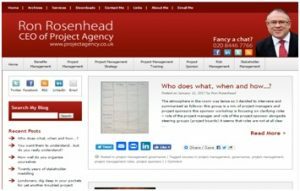 CEO of Project Agency in the UK, he answers common questions that create problems for project managers through his blogs. You will find some unique ideas on his blog because the ideas he discusses on his blog are usually those that came during work. He shared helpful tips on scope management and source of inspiration in our exclusive interview. Project Times is not like your traditional blog. 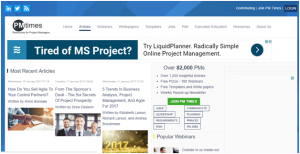 It is a web-based magazine dedicated to project management. Whether it is the latest project management trends or insights from project management gurus, you can find that and much more on this blog. The Project Times job board helps young project managers find the right job and make this blog stand out from the rest. 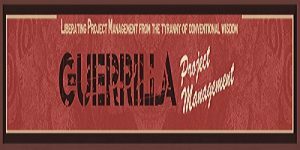 The articles on this blog cover core project management topics and provide you with something to think about. If you are tired of reading run of the mill stuff on project management, then project management hut has something that will bring a smile on your face. Dubbed as “huts”, they are the collection of articles that provides you in-depth knowledge on various topics. Although, you will find conventional informative articles on Project management hut’s blog but the huts are the real highlights. It covers every aspect of project management from scheduling to risk management. You can also read topics such as conflict management, procurement management, communicating with stakeholders, etc. Let us keep the gender biasedness aside for a moment and give female project managers something good to read. This blog provides an opportunity to look at things from a female project manager’s perspective. 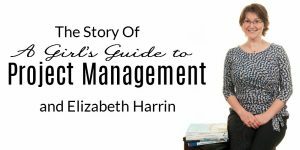 Elizabeth Harrin, an award-winning blogger, regularly offers her suggestions and opinions for female project managers through her blog. Moreover, female project managers can learn a thing or two about managing project teams, conduct fruitful meetings and maintain a work-life balance via this blog. 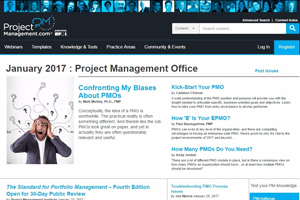 Project management tool reviews, free eBooks and much more makes it a must visit blog for the female project managers. Want a unique perspective on project management and other domains such as social sciences, psychology and organizational change? If yes, then this blog is for you. The author Samad Aidane words sum it up brilliantly when he said, “Liberating project management from the tyranny of conventional wisdom.” With almost two decades of experience in project management, this blog can help project managers in improving their performance, develop their skills and manage risks effectively. After reading this blog, you can make both your personal and professional lives better. 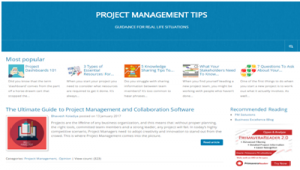 As compared to other blogs on this list, Project management tips blog is formal. If you are expecting some humor, then you are out of luck. If you are looking for some valuable advice, then you are at the right place. The list posts on this blog make complicated concepts easier to grasp for readers. 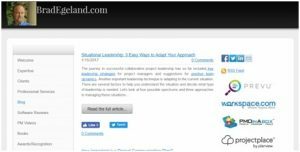 In addition to this, you might also find guest posts from other blogs and project management experts on this blog. The variety of content this blog publishes ensures that you do not get bored with it. Thanks for including my blog in this list! Your blog is unique and informative. We are pleased to include it on our list. We are a very popular blog for project management. Is it possible to be included in your top 10? Maybe you could replace Brad Egeland’ blog by us? Brad Egeland website only contains partial articles with external links to the full articles. I know this site and it’s not very well structured. Anyway, let me know what you can do. Thanks alot for pointing out the editorial mistake. I have sent you a detailed email about the possibility of your blog’s inclusion in the specific list. Thanks Synquis for the appreciation.. Subscribe to our newsletter and stay tuned with interesting posts from our blog. Hey, great list of top PM blogs! We have a lot of the same tastes; I wonder how these, above the others, made the list? Brand recognition? Domain authority? People you know? These are all big players so I’m not surprised they made an appearance. I recently wrote a roundup of the top blogs for PMs and used update frequency, user friendliness, domain authority, specialization, and prevalence of “useful” content to filter through. Feel free to take a look; I came up with a few of the same and a few different sites than you. Thanks a lot for your keen interest. The list was not on any specific basis as you mentioned but a random list. Moroever, our community representative will contact you soon for more detailed discussion on this. This is a great blog listing. Ours, blog.greenprojectmanagement.org has a following of over 76,000 and is unique as it focuses on sustainability in projects. Any chance of considering it? Thank you Joel for the appreciation. I have forwarded your request. Our community representative will contact you soon. Thanks for this list of project management blogs! It’s always helpful to learn from others about their successes and failures with project management. You can learn from their experiences and apply it to your own. It’s important for anyone in the PM role to keep up with what the latest obstacles are and how to fine tune your PM skills. These blogs are a great way to do so! Thanks alot Yash. You are absolutely right. These blogs are a great source of knowledge. Moreover, you get information about the latest tools being used by project managers worldwide. 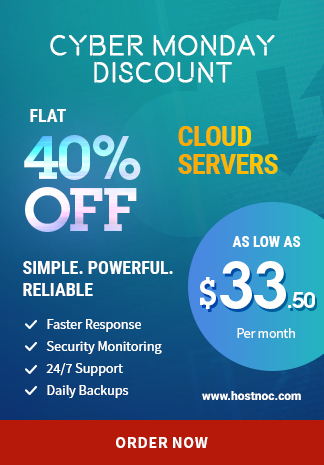 They may help you in project planning, project execution, cost estimation, resource management,etc. 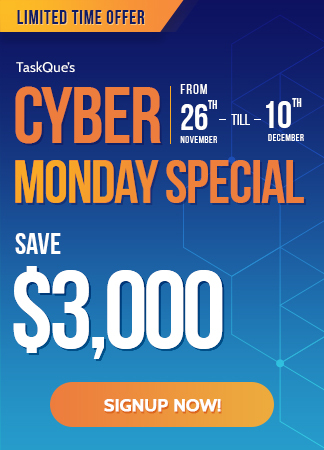 TaskQue itself is a team collaboration tool which helps in effective resource management. 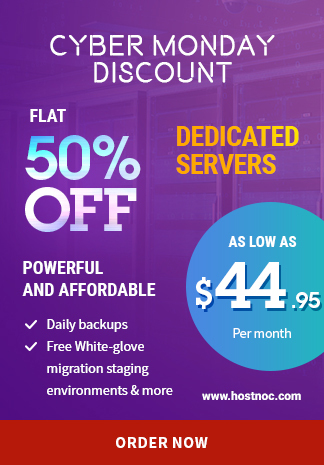 I suggest you and all the managers to try every tool and select the one which suits your needs. Thanks Sarmad, that’s informative. It might be useful to consider agile focused blogs in the future as many companies desire more ‘agility’ and have increasingly mixed/hybrid delivery models.